The official picture blog of photographer Kristian Bertel. Read about his photography and thoughts about his photograph from Rajasthan, India. his photography and thoughts about his photograph from Rajasthan, India. Picture of a nomad Indian girl in the Great Indian Desert in Rajasthan, India. India is perhaps one of the most stunning and amazing places on earth. Most noted and talked about today for their advancements in the tech industry, the country is deep with history and tradition. This picture blog of Kristian Bertel shows the stunning faces of India, and how diverse and beautiful the people are, who are living in one of the most amazing countries in the world. 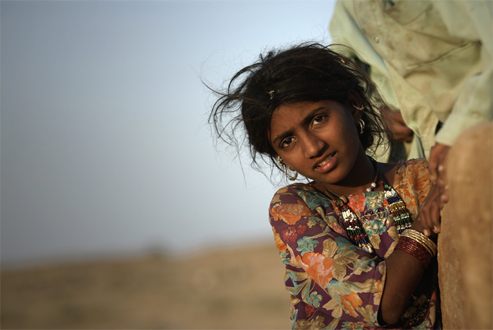 Kristian Bertel's iconic picture of a nomadic girl is captured in the golden Thar Desert in Rajasthan. This desert is a large, arid region in the northwestern part of the Indian subcontinent and forms a natural boundary running along the border between India and Pakistan. The piercing eyes of the girl that has graced the front page of his website since 2008 and has become known as the 'Indian Girl'. Photographer Kristian Bertel was a on journey and visited a nomad family in the Great Indian Desert, India, where he was photographing a story on India. He cheerfully began photographing many of the children. Kristian noticed one young girl with striking brown eyes. "- After taking a couple of frames, her first laughter was away and I had a chance and encouragement to keep taking more frames of this girl. She was looking into the lens with her intense and focused gaze. I was convinced that I had something great. A picture caught in a mere moment", the photographer says. He shared his thoughts on the child: "- There's a real emotion and a real beauty in the picture. Her expression is ambiguous - she's obviously poor because she is living in these conditions and her hair is kind of dirty. But through that there's a dignity and a perseverance and fortitude." Kristian is known for his Indian pictures, which started as an ongoing project on India in 2008. He began taking humanitarian-based images of the Indian people and their life conditions. He turned his attention to documentary photography and his work is published on his website, which contains 12 galleries that describe common life in India. At around this period he came to the attention of poverty in the Indian cities and he began to document child beggars. He shot a seminal essay on India’s street children called 'Child Beggars of New Delhi', an essay, where his pictures became more photojournalistic motivated. Kristian's work has been shown internationally on National Geographic Traveler as Travel Favorite Photos and his photos have been nominated for 'Your Shot' in the Nordic edition of National Geographic Magazine. Kristian, a dedicated traveller, always tries to depict life in a pure and simple - yet sensitive, manner, uncluttered and unstaged. Giving the viewer the feelings and emotions, he experiences while shooting is what he tries to accomplish in each photograph. Kristian's photographic work, with more than 400 photos from India, can be seen as slideshows on his website. Kristian has depicted his journey in carefully selected series of photographs. He shows a collection of imagery featuring photographs of Indian people, cityscapes and landscapes, as well as everything in between - a true slice of life of modern and traditional India. His exhibitions galleries are arranged over 12 themes with works selected from his 2008 voyage. They tell the story of a photographer’s development in the subcontinent with over 400 works that have been brought together for the first time. It encompasses social realism and reportage of everyday moments, snaps from the villages and street photography from the cities. "- I usually have a camera with me and I'm always looking. I may not shoot everyday but it is all part of the process of learning how to see and discovering what interests me photographically. For me, it starts with an appreciation of light and colour. Light produces color. It can be soft or intense. Colour can provoke or excite as well as inform. At their best, light and colour can come together at a moment in time and create an atmosphere, emotional response and/or a sense of place and for me, that is the power and joy of the colour of light", the photographer explains. India, a country blessed with enormous diversity and great attractions. India is one of the oldest civilizations in the world with a kaleidoscopic variety and rich cultural heritage. India's history and culture is dynamic, spanning back to the beginning of human civilization. It begins with a mysterious culture along the Indus River and in farming communities in the southern lands of India. The history of India is punctuated by constant integration of migrating people with the diverse cultures that surround India. Incredible India has been imprinted with the heritage, culture right from the Pre-historic Indus Valley Civilisation through the ancient Vedic ages followed through with the formation of Buddhism, Jainism and Sikhism, which again was trailed by Sultans, Mughul, and European colonies. India is the land of cultures, traditions, diversity and beauty and is one of the most sought after vacation destinations across the globe. India is known for its rich traditions and diversity. A diversity in its culture, food clothing, and languages has made the country unique. India's ancient culture, the rivers, mountains, vegetation and exotic spices, make the country a wonderful place to visit. India's rich and multi-layered cultures are dominated by religious and spiritual themes. While it is a mistake to assume that there is a single unified Indian culture, there certainly are unifying themes that link the various cultures. India's cultural heritage is expressed through its myriad of languages in which much great literature and poetry has been written. It can be seen in its music - both in its classical, Carnatic and Hindustani forms and in modern Bollywood music. India also has a vast tradition of classical and folk dances. Art and theatre flourish amongst the bustling cities of the country, against the backdrop of the ever expanding western influences. His portraits show a wide range of diversity and he explores close bonds and with the populations through contemporary portraits. His galleries take a look at the built environment, social documentary and street photography as well. Kristian's photos give an inside view of how modern and rural India have been shaped through the lens of a photographer. "- As a photographer, you see the best and the worst of humanity. You're lucky when you're able to witness the best. But when you see the worst, you truly realize how fortunate you really are. Every day is a different experience and as a photographer I've had so many different and great experiences." And he continued: "- I travel to open my heart and eyes and to learn more about the world. But more significantly, I try to carry the values and the beliefs of the places I visit in many parts of the world", the photographer says. Since 2008, he has been exhibiting his works, most recently at his website. Focusing on travel photography the photographs of the photographer are displayed in galleries on his website. If you are interested to see more photos and imagery from India, you can see one of the slideshows, which also appears on the photographer's website. Kristian Bertel's website is listed in many photography directories. This gives him the great joy of giving his viewers an insight into his world of photography where light and color means everything. His website is listed on ProsPhotos and Photography Directory Project, which are photography website directories with photography websites. Colorado's premier nature photographer, John Fielder. Learn about John's upcoming events and workshops and view his books and fine art prints online. Photography - #1 Site For All Your Photo Needs - Photography and Cameras articles and resources. Online Digital Photography Courses from Indian Institute of Photography, Learn Photography Amateurs, Schools, Colleges Students DSLR, Wedding, Wildlife, Fashion in Delhi. Experience best of India Tour with Annonline. Explore more than 600 tour packages under various themes or ask us to design custom made tour and holidays. Provides complete all India tour Packages. For attractive India tour packages contact our tour experts. inTravel Magazine provides in-depth coverage of unique destinations worldwide. Volunteering abroad, living abroad, student exchange programs, eco-tourism, and yoga retreats are featured and the incognito contest gives a chance to win free trips! Kristian Bertel | Photography is recommended by http://www.voyagelinks.com. Our website is recommended by http://www.reiselinks.de. A world-wide travel directory, listing only the most useful websites for inclusion, for both local and international travel. Detailed information about the cities you want to travel. ListedPhotographers.net - The Best Photographers on the Net!